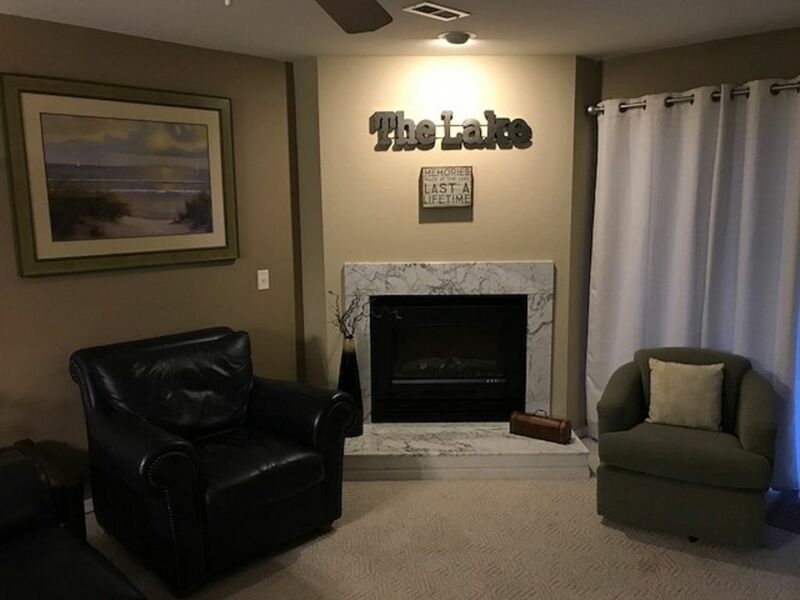 Welcome to Wander's Retreat, a condominium made for a relaxing getaway nestled in the heart of Lake of the Ozarks. It is located just off Highway 54 at lake road 54-56, also known as Nichols Road Exit. It is minutes away from the Osage Beach Premium Outlets Mall, several spectacular golf courses, Big Surf Water Park, Lake of the Ozarks State Park, as well as miniature golf and go cart tracks for the kiddos. We are located at the 20 1/2 mile marker of the Osage Channel. If relaxation is what you're looking for, enjoy a large covered balcony overlooking the sandy beach and one of the two pools. This fully loaded condo has all the amenities of home including a gas grill, dishwasher and a kitchen with all the necessary utensils for preparing and indulging in home cooked meals. Living room and both bedrooms have flat screen TVs. Living room is also set up for your Netflix and Hulu. 45 different movies to choose from on lazy days. The master bedroom has a queen and the extra bedroom is perfect for the kids or adults as it is equipped with a bunk bed setup. Second bed is a queen. 2nd bedroom is set up for gaming and watching movies. Additionally there are 2 full bathrooms. Plenty of room for everyone. After a good night's rest be sure to get out of the condo and enjoy either of the two pools on site and all the Lake has to offer. There is a covered 10 x 24 boat slip available to keep your water toys secure during your stay (additional fee). You can fish from the lake and there is a cleaning station adjacent to our boat slip. Although we love four legged family, Please NO Pets. Bar that sits 4 and table sits 4 . Stayed for a few nights and just loved the excellent price and experience of staying there. We weren't far from any attractions as most were only 10 minutes away. The rooms were clean, the facilities worked, and it was just a great place to decompress. I thouroughly enjoyed how easy it was to rent as well as how affordable it was. Would definitely stay again should the opportunity arise. My daughter and I had a great weekend. The condo was the cleanest we have ever stayed in and the beds were really comfortable. would definately stay here again and recommend it. This is a great unit. It was very clean and modern. Hope to stay again in the future. Tips...make sure customers know that 1481 is actually B13. Heat in bedrooms lower than main room. Pluses: fireplace, beds comfy, well furnished. Great Location and super clean and comfy. I will definitely come back and stay here again A plus all the way around.